Shortly after Christmas, my wife and I got to laughing. You know the laugh… the one that’s half hilarious, half pathetic, sillier than silly and for seemingly no good reason. That was us. And that was the “Gufaw” moment… or, in modern internet parlance…. the “BAHAHA” moment. For although the spray paint represents an investment, there will never be a shortage on used toilet paper rolls. Used tuna tins make a great place to store the loose change that accumulates on your dresser. Used soup or canned fruit tins make an equally great place to store receipts, pens & pencils or other loose bits of paper that collect (on same dresser… mine – I wonder if she’s trying to tell me something). Our Christmas tree was adorned with simple white styrofoam balls “hanging by a thread” to (a) imitate snowballs and (b) make for inexpensive decorations. Used ice cream containers have taken the place of tupperware for storing leftovers or muffins and replace the cookie jar on the days that cookies have been freshly baked. Oh yes… said ice cream containers are also a great solution for storing my neck-ties. Used peanut butter tubs are a great place to store nuts & raisins purchased in bulk as opposed to leaving them in a bag that, once opened, causes freshness to escape. Had we been living in Canada, there is little chance that I’d have my change or my pens, etc. stored in used tuna or soup cans on my dresser… uhhh, no… just no. At the very least, I’d have gone to an antique or a used goods store and looked for something like an old, thick glass jar for pens and maybe a discarded pottery soap dish for my spare change…. something with just a bit more character than tin cans. I didn’t voice my unspoken “UGH!” (for it was indeed most likely an all-caps ‘ugh’) because after nearly 20 years of marriage I have gained enough wisdom to know that introduction of the tuna can meant that Liz had grown tired of seeing my spare change lying around. The tuna can would not only keep it contained, but also out of sight because the lid of said can was also present and could be set on top. With time however, something strange began to happen. I learned to simply lift the lid, drop in the change and replace the lid. No flinch, no internal Ugh! I barely thought of it anymore. I grew accustomed to the can. The same process took place with my ties in the ice cream container. My initial (and still internal) “Ugh!” was replaced with acceptance and a willingness to just flow with it. It did after all keep the shelf a whole lot more tidy. Oh I know it may not look great but it keeps them organized and the fact that they’re rolled keeps them from becoming wrinkled and unsightly to wear. *update* a clothes-hanger-style tie & belt organizer made its way ‘neath the tree at Christmas. So this ice cream container is now free to hold more freshly baked cookies. We all win!! Oh that’s easy. STM is humbling because from a financial standpoint your life (and lifestyle) will become much different. This may not be all that noticeable if you’re only on STM for 3-6 months… you kind of expect it and it’s just part and parcel of the short-term experience. When you’re two years in however, like we are, it’s a little different. It’s less of a short-term thing and more just day-to-day life. You live below the standard of living to which you’d long been accustomed. Friends and family offer to treat you to dinner and you’re unable to reciprocate. Plans are made and in the back of your mind you’re wondering what the implications might be later. You also wonder where Peter is (you’re going to need to rob him in order to pay Paul). You are less able to simply be spontaneous. As my wife said at the time…. you lose control. It’s humbling to lose control. It’s very spiritual to say that “our trust is in the Lord” and we say it a lot. There are also times that it’s just downright hard; you’re forced, for better or for worse, to rely on the Lord and on his people. Of course the Lord provides. …but the whole process is humbling. The positive side is that, in the end, you become a bit more used to not getting caught up in as many of the trappings so common in a consumer-driven society. You become accustomed to a bit more simplicity… and that’s positive. This world is not our home, we’re just passing through. But coming to the place where adopting that attitude is a comfortable place to live puts you in direct opposition to mainstream society – whether inside or outside the church, and that positive change, dear friend… is the result of a very humbling process. You’ve already done one STM trip, perhaps even two… where do you go from here? 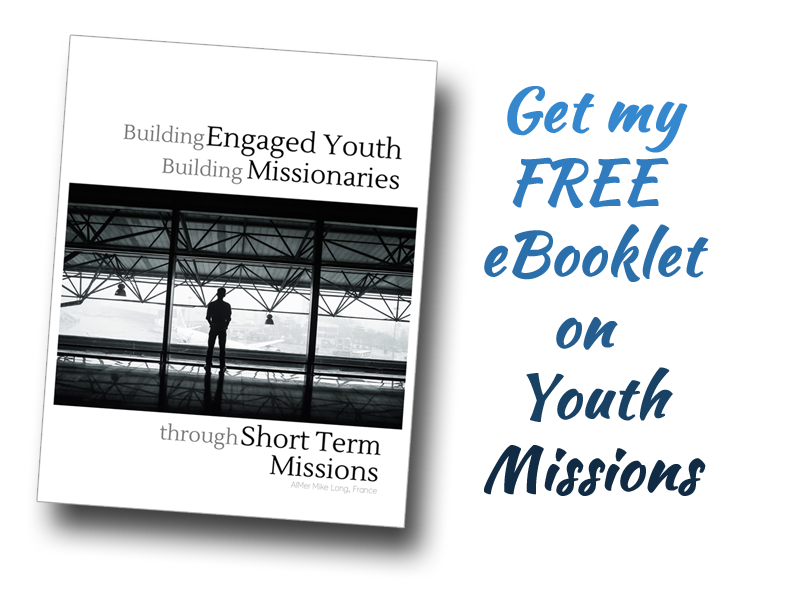 Traditional companies often have a career progression, but what about missions? I’ll share what I’ve gleaned next time. “This world is not our home, we’re just passing through.” What a lovely thought. I shall hold onto that. Also I love the idea of making do with tuna cans and ice cream boxes. I too often use ice cream boxes for spices and the sort. Thanks Dippy-Dotty Girl… Glad it resonated with you. It’s actually a phrase taken from an old Gospel song: “This world is not my home, I’m just passing through, my treasures are laid up, somewhere beyond the blue…” and the idea is based on several Bible verses that talk about how as Christians, we need to think more about eternity with God and less on what is temporal & passing… Sometimes it’s SO easy to get overly caught up in the minutia; the stuff that’s of little eternal value. Have a great day DDgirl!! Thank you Mike. You too have a wonderful day and those lines are beautiful. I am not an essentially religious person but spiritual thoughts make me contemplative.